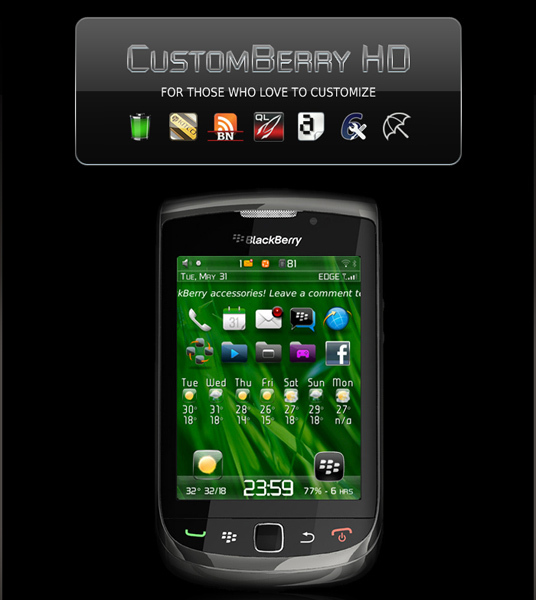 CustomBerry HD by Global Torch Themes - Act fast and get 40% off! BlackBerry Torch owners, are you looking for a theme you can customize to show off all your favorite apps, and that gives you control of your docks and color scheme? Do you love BerryWeather, but have trouble finding a theme that lets you use it how you want? Are you a fan of the BreakingNews app, but nowhere to fit it on your screen? Look no further, because Global Torch Themes has released CustomBerry HD to help solve all your (theme related) problems! CustomBerry HD gives you the option of having one, two, or zero docks on your home screen. If you're a wallpaper junkie, this is an option you will especially appreciate, I'm sure. Above the dock area is the perfect spot for BreakingNews, tucked away under the top banner. BerryWeather fits nicely under the docks, and above the bottom banner. Speaking of the bottom banner, you have dual weather/OCD slots, so even if you don't use BerryWeather, you can still have your forecast showing. I also mentioned that you can change your color scheme up. GTT has included six skins with the theme, so you are sure to find a match for your favorite wallpapers. Hotspots for Clock/Alarm, Manage Connections, Messages, Media, Application Menu, QuickLaunch, and Profiles are also included. If you're looking for a beautiful, high quality theme for your BlackBerry Torch, you'll really want to take a close look at CustomBerry HD by GTT. You can use coupon code CBCUSTOM from your device to get 40% off the regular price of $5.99, which isn't a bad deal considering how much you can customize this theme. It's like having several themes in one! Don't hesitate though, the coupon is only good for the first 50 people, so hurry up!